Last weekend we were at a friend’s house who served this really yummy Asian Broccoli Salad. I was actually quite surprised at just how simple it was to put together. I cheated though, I didn’t make this. This is some of the salad I gleaped and brought home with me. ;) Very tasty! This salad is great just like it is, but I can see several possibilities here, depending on your tastes. Some chopped nuts, maybe walnuts or almonds, would be a nice addition, or maybe even some soy sauce? Rice wine vinegar would be good, instead of the white vinegar too! This was so good, I love this recipe! Thanks for all your comments! 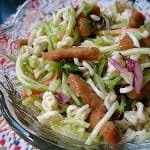 Love broccoli Slaw for large gatherings. Thanks. 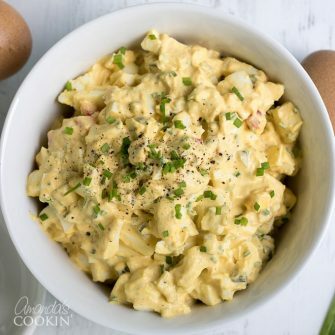 Walnuts or almonds are welcomed in my salads and this one is excellent with or without them! I love cabbage and Asian flavors so this is a perfect combo of flavors. Thanks for sharing. I'm gonna keep your suggestions in mind, too! I have heard of using sunflower seeds as a topping for this salad. Yummy. 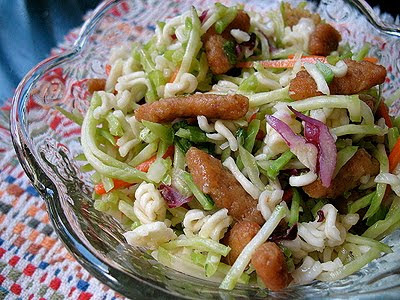 I love a good asian slaw and I slmonds would go perfect! I love this type of salad. Your additions sound like they'd work well too! Looks delicious and I have a bag of broccoli slaw in the fridge just waiting to be used. 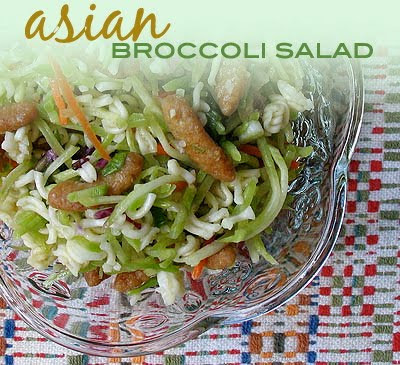 Ooo this is very similar to a broccoli slaw I make! I love the addition of the sesame sticks, yummy! !